Home » Literature » Sporting Superstars making Ekamra Sports Literature Festival made the event a grand success. 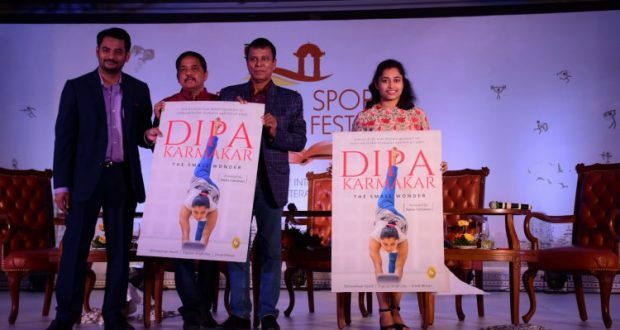 Sporting Superstars making Ekamra Sports Literature Festival made the event a grand success. Bhubaneswar:3/11/18:With a spectacular Day One of the Ekamra Sports Literature Festival setting the stage for an exciting amalgamation of sports and literature, the concluding Day Two took the bar of insightful discussions even higher. Ace sprinter Ben Johnson, author Richard Moore, the champion wrestlers of India Vinesh Phogat, Yogeshwar Dutt and Bajrang Punia, Javelin’s poster boy Neeraj Chopra, swimming champion Stephanie Rice, Indian test vice captain Ajinkya Rahane, author, hockey expert and festival director Sundeep Misra and ex-Indian hockey captain Sardar Singh and launch of cover of Dipa Karmakar’s biographical book, made the event a grand success.